Millions are at risk, but “No One Should Die From A Tornado”®. Bill Ford, a veteran storm tracker and certified first responder, has pulled many people out of the rubble. He has also witnessed the best and worst storm shelters in real life disasters. 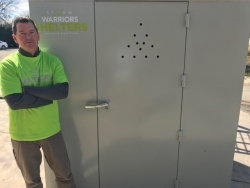 He has taken his extensive experiences and is announcing the launch of Storm Warrior Shelters just in time for spring 2018 severe weather. Keep your family safe from every storm this season with a Storm Warrior shelter in your home. The innovative design provides excellent protection and ease of installation. The team at Storm Warrior Shelters is committed to providing the best way to make the most families safe from every storm®. According to founder, Bill Ford, it is important to Know Where to Go® when severe weather approaches and these shelters, that fit conveniently into garages, provide that safe place. It was his goal to make the shelters as affordable as they are safe and to provide shelter and protection to families. About 1,000 tornadoes touch down in the United States each year, mostly in the states east of Arizona. Even a weak EF1 tornado can destroy a home, but an EF5 can devastate an entire neighborhood or town. So, it is important to have somewhere to go. Storm Warrior Shelters are FEMA compliant and are available for immediate delivery and installation anywhere in the continental United States.